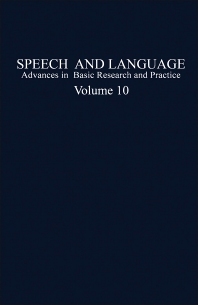 Speech and Language: Advances in Basic Research and Practice, Volume 10 is a compendium of articles that discuss a wide range of topics on speech and language processes and pathologies. This volume contains seven papers presenting a broad range of topics on speech and language. The book provides various articles discussing topics on the articulatory and perceptual characteristics associated with apraxia of speech; prevention of communicative disorders in cleft palate infants; and the relationship between normal phonological acquisition and clinical intervention. Topics on the role of auditory timing in the diagnosis and treatment of speech and language disorders; categorical perception; and the theoretical and clinical implications of speakers' abilities to control the output of their speech mechanism are presented as well. Linguists, speech pathologists, and researchers on language development will find the book very insightful and informative.